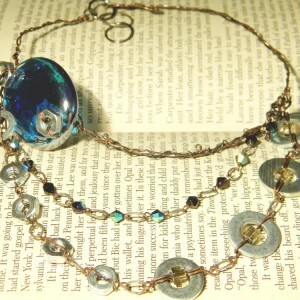 Anything you find on my Etsy are completely handmade and one of a kinds. They hold an oxymoronic duality of what is delicately feminine and modern grunge. 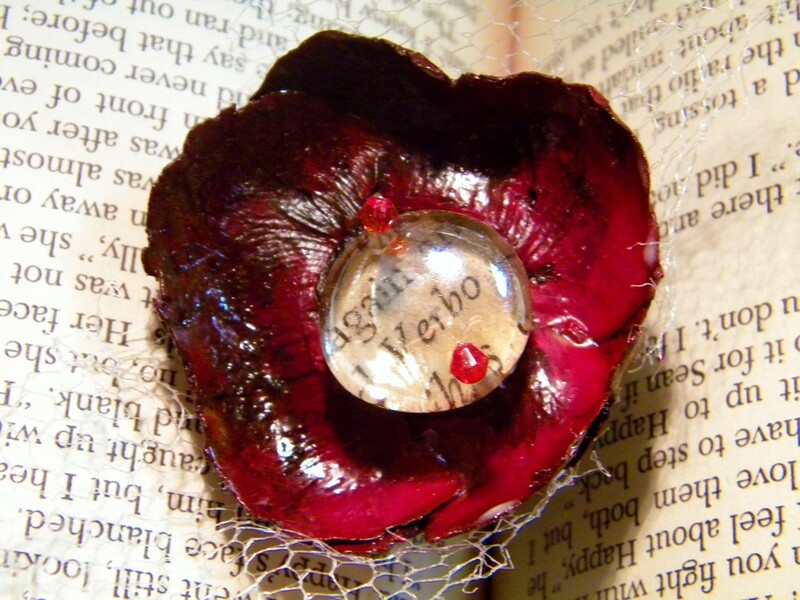 I use materials that are more commonly found in the 1800’s like lace , tulle, pearls combined with dried flowers with leather, crystals and glass. I’ve always thought that if you would bring back a souvenir from your favorite dream, it would be what you wold find in my store. Fancy yet casual, you can wear it to a ball or with jeans, so you never have to WAIT for a special occasion to show off these goods! I consider them costume jewelry from a land of fantasy. An Alice in Wonderland Addict idealist, that is constantly dismayed by the dark side of wonderland. Unable to cope with reality, so instead I reside in a reverie created by my imagination, which is often interrupted with necessary visits to the real world, Wonderland. I fell down the rabbit hole when I was 4, and I've been pirouetting in unbirthday parties ever since. My reverie is made of all things artistic including but not limited to arts in theater, film and film making, visual art, music, storytelling, photography, novels, dance, singing, script writing, knitting, drawing, painting, ballet, tap and jazz, journaling, acting, singing, yelling at people, writing suicide notes, deep reflection, shallow thinking, twirling my thumbs, walking on water, jumping off cliffs, talking to myself while I glow in the dark, kissing boys while riding a unicycle and juggling pointe shoes, trying to catch the back of my head cooking bunnies with orange marmalade, and day dreaming. I've always used my art to escape reality as far as I can remember. I'm a deeply sensitive and reflective person, and at times I just can't take the cruelty of our world. But in arts, you create your own world and you call the shots. I have yet to find a world that gives complete freedom for self expression and yet so beautiful and appealing to all the senses as the art world.. As a kid, I've I spent a great deal of my time alone. I believe that's how my imaginative side first started to develop, almost out of necessity as a defense mechanism. It started out as drawing and painting and through out the yrs it just morphed in all sort of different forms. Alice in Wonderland has always been my main source. It is my favorite story of all times. As a kid I watched the Disney version and just found the characters colorful and delightful. But as an adult, when I rewatched it, I saw profound hidden /messages which the author was REALLY trying to convey. I'm such a curious and idealistic person, that I have yet to find another character other than Alice whom I resemble and relate to more. 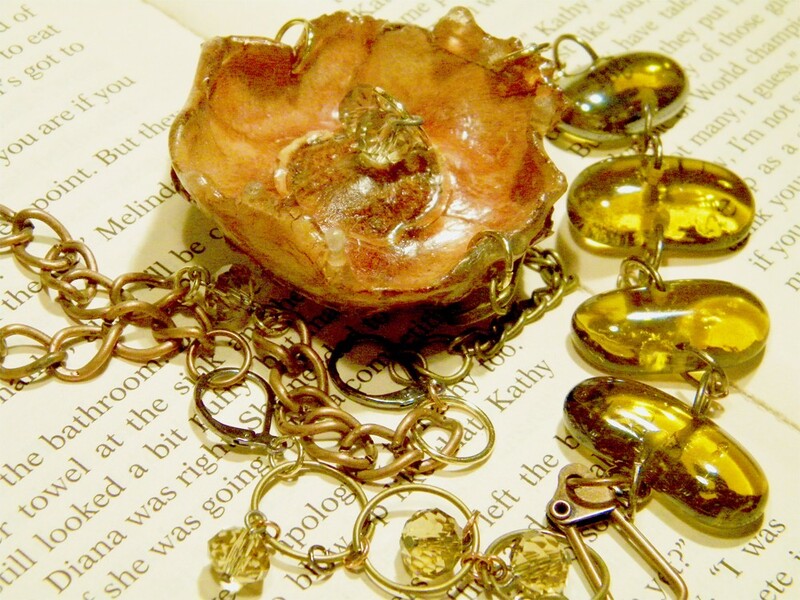 LIke the story most of my jewelry have some sort of special words or message written on them. I believe that truly good art are not only aesthetically appealing, but it should also deliver at message that should inspire other creative minds. The last thing I made is a leather wristband/bracelet that reads " Off with Her Head Now!" 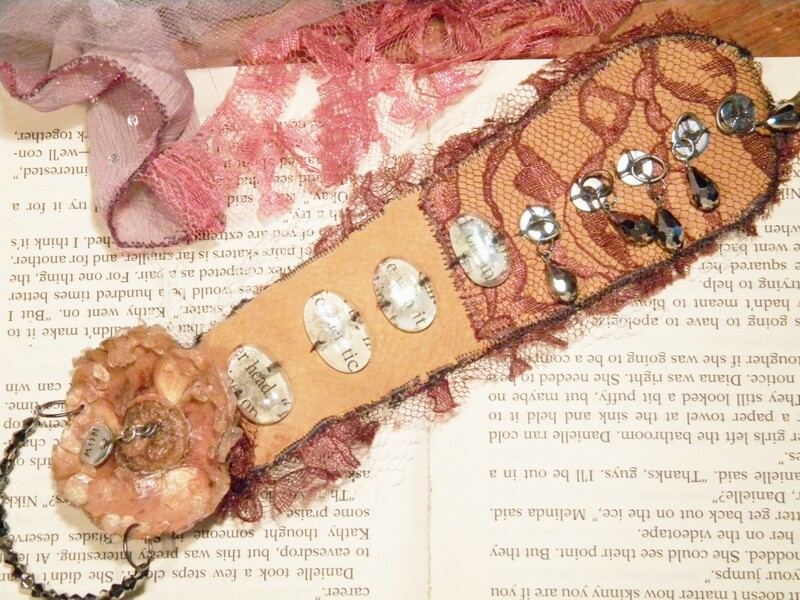 I sewed genuine leather, torn brown lace and , torn white tulle, vintage colored pink ribbon by machine and hand to give this wristband to a vintage grunge look,. 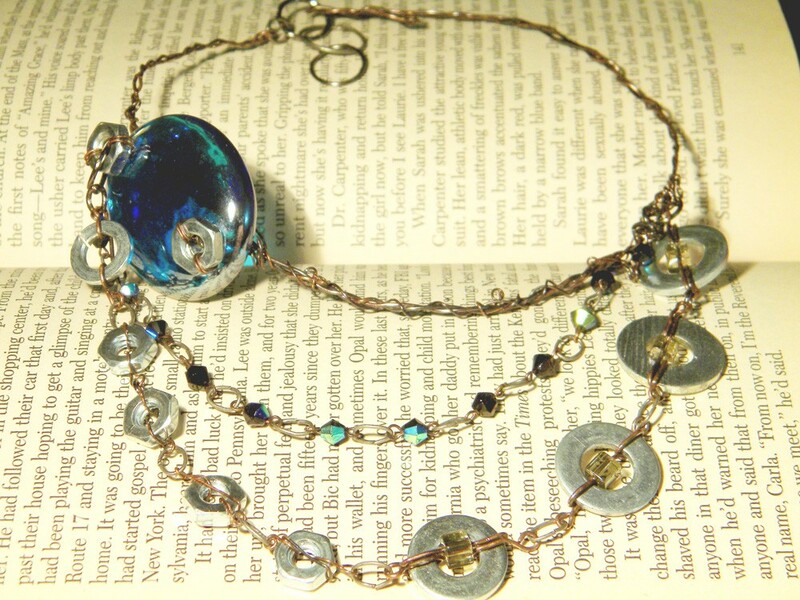 The four oval glass beads read's" off with her head!" 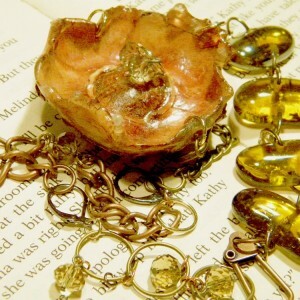 and the single small silver charm on a real dried flower read's " now". I've added layers of coating to make this flower very strong. The whole thing is covered with pale pink minerals, so it looks like it's got crystals all over it! I beaded some with black and silver small faux crystals on memory wire and attached it to the flower. There's a total of 3 clasp so it's completely adjustable for a WIDE RANGE of size. Underneath the flower are 2 gun metal colored ones, one dangles right on the edge of the band and another one dangling at the end of a combo of thin silver chains and a large black chain. 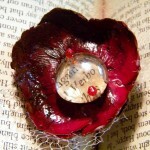 These can be cuffed on to the the silver teardrop beads which are sewn on small silver washers. On the other end is an antique colored gold lobster clasp which clasps to the backside for extra tiny wristed girls! I sell my jewelry solely online in etsy. I find it so special that they are often one of a kind and tend to be intricately detailed and unique. It's a chance for the designer to display the products of their imagination. To me each piece of art is a blank page for the artist to self express what they find worthy. Handmade art not only delivers what is appeasing to the senses, it serves as a sample of the content in the mind of the maker.